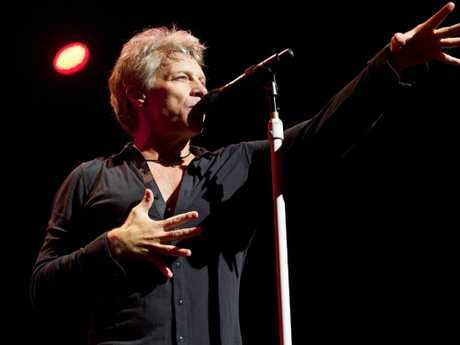 BON Jovi fans have been livin' on a prayer for the band to book an Australian tour. After months of speculation, the American rockers will play one stadium concert each in Sydney, Melbourne, Brisbane and Adelaide in December. The recent Rock and Roll Hall of Fame inductees, one of the last stadium rock bands still standing, last played Australia in 2013 on their Because We Can tour. 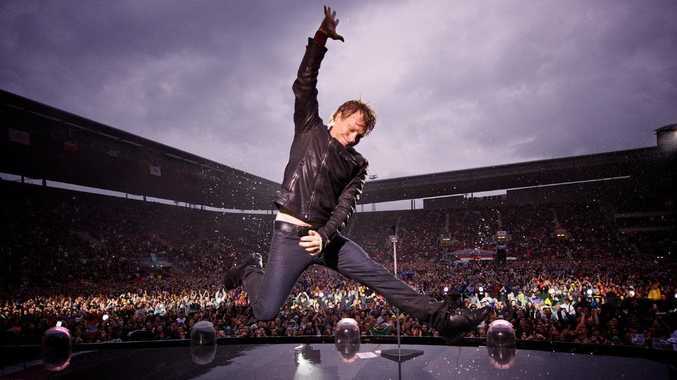 We’re halfway there … Bon Jovi gets epic air during their gigs. Picture: David Bergman/Supplied. They kicked off their This House Is Not For Sale tour in the US in February last year off the back of the release of their 13th studio album in late 2016. The album and tour marks the recognition of guitarist Phil X, who replaced founding member Richie Sambora, and bassist Hugh McDonald as official members of Bon Jovi. Jon Bon Jovi has said the album, inspired by a black and white montage of an old house anchored by thick tree roots by American photographer Jerry Uelsmann, was about the band's resilience in an era where rock no longer dominates the airwaves or charts. That image is the cover artwork for This House Is Not A Home. Bon Jovi are one of the last stadium rock bands. Picture: David Bergman / Supplied. "One day I was thumbing through a magazine and I came upon a photo by Jerry Uelsmann - he took it back in 1982, and like a laser beam, it just went bam. Right there I just said 'This house is not for sale', I saw the story, I equated it to me, the band and my life," Bon Jovi said. After an acrimonious split, Bon Jovi and Sambora were reunited at the Hall of Fame ceremony in Cleveland in April - along with original bassist Alec John Such - and thrilled with their hits-laden set which included You Give Love A Bad Name, It's My Life and of course, Livin' On A Prayer. Bon Jovi, who has sold more than 130 million records worldwide, have enjoyed a long and successful relationship with their Australian fans. Eight of their albums have reached No. 1 here, starting with the 1986 global smash Slippery When Wet. Bon Jovi will play one-night-only in four Australian cities. Sorry Perth. Picture: Supplied. Rumours of a 2018 tour of Australia ramped up after Bon Jovi's tour manager and Jon's brother Matthew Bongiovi posted cryptic Australian-themed memes of koalas and kangaroos with the hashtag #runawaytours. 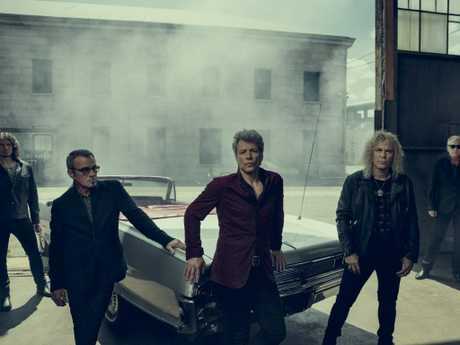 Bon Jovi will perform at the Melbourne Cricket Ground on December 1, Botanic Park, Adelaide on December 4, QSAC, Brisbane on December 6 and ANZ Stadium, Sydney on December 8. Tickets go on sale on June 29 via Ticketek. There will be a Telstra Thanks pre-sale via tesltra.com/bonjovi from June 20.